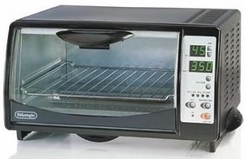 A versatile, functional toaster oven ideal for the busy family. Bake, broil, toast and warm functions, and multiple cooking settings with adjustable temperature controls make cooking quick and convenient. The innovative Quick Check feature lets you easily check the oven temperature for accurate results. Includes bake pan, broil tray, crumb collector and a single-tier pull-out tray to accommodate all your food preparation needs. Size: 7" x 12" x 11"